Meet Willam, Harold, and Lew Christensen, three small-town Utah boys who caught the ballet bug from an uncle in the early 1900s. They performed alongside elephants and clowns on vaudeville, immersed themselves in the New York City dance scene, and even put on a ballet featuring gangsters at a gas station. Russian immigrants shared the story of The Nutcracker with them, and during World War II – on a shoestring budget and in need of a hit – they staged their own Christmastime production in San Francisco. It was America's first full-length version and the beginning of a delightful holiday tradition. Barton offers a lively, colorful text and follows up with a very informative time line, illustrated with period photos. ... In her picture book debut, Gendron turns in a virtuoso performance. ... Even readers familiar with The Nutcracker will probably learn a good deal from this engaging picture book. Bravo! Brava! 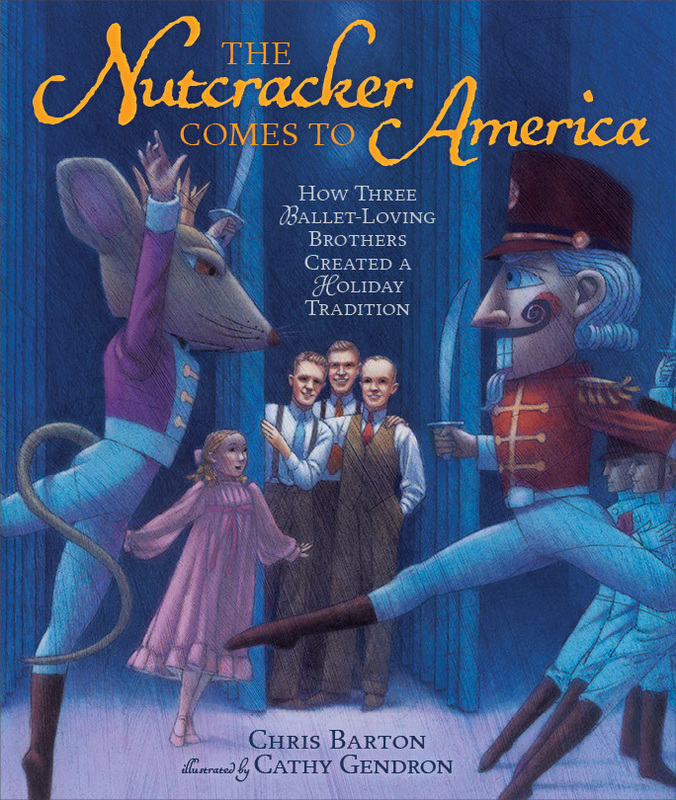 Balancing evocative turns of phrase with a crisp, forthright narrative, Barton delivers an involving account of how watching The Nutcracker ballet, which originated in Russia, became an American holiday tradition. ... [A] fascinating bit of artistic investigation, one with year-round appeal. This is much more than the story of the transplanting of a famous Russian ballet. And not just a book for little girls who dream of dancing in tutus and pink satin pointe shoes. This is a real-life adventure story about "a trio of small-town Utah boys" with grit and talent, who bucked stereotypes, endured failures and persevered, and who individually and together enriched the cultural life of America. This well-researched history tells how three brothers from a small town in Utah came together to present the first full-length version of The Nutcracker in America ... [which] started a holiday tradition that continues to this day in cities across the United States. Gendron's colorful illustrations capture the historical setting and the action and drama onstage and off. ... A terrific choice for fans of The Nutcracker and all things ballet. Barton's folksy, direct-address text introduces three brothers from Utah, all dancers, who eventually teamed up at the San Francisco Ballet to present the first full production in the United States of The Nutcracker, on Christmas Eve 1944. ... Gendron's art effectively reproduces traditional ballet poses and makes the most of the book's large trim size. This is a good book to share with children after seeing a performance of The Nutcracker. Barton narrates the brothers' tale skillfully, chronicling the ups and downs of their collaboration ... a holiday story but also more. 'The Nutcracker' Comes to America is about family and how sometimes, what connects you to them is what you all love to do together. This book is history, tradition and storytelling all in one. I believe it will be part of many holiday traditions, displays, and book lists for years to come.